Tara Brown Foundation / Media / Lisa Wilkinson calls for action on domestic violence on the Today show. 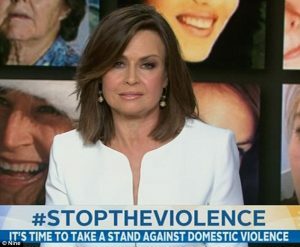 Lisa Wilkinson lent her voice to the plight of all victims of domestic violence today as she led a segment on The Today Show addressing this week’s devastating events. As she sat solemnly with a background made up of the many faces of women whose names we now know only in death, she called for action on domestic violence. With one poignant statement, she summed up how Australia is feeling today. 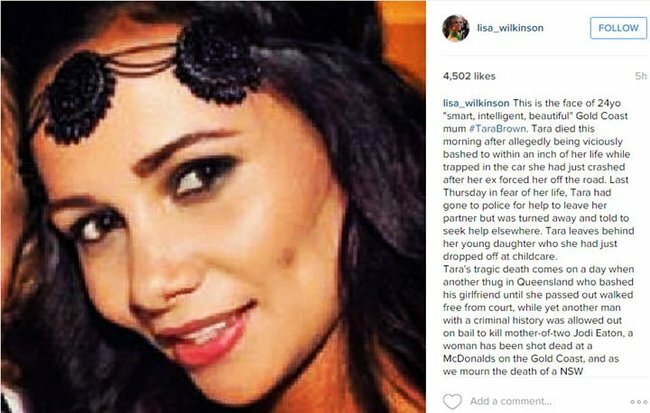 Like all of us, Lisa Wilkinson is appalled and horrified by the senseless death of Queensland mother Tara Brown, 24, allegedly at the hands of her ex-partner. Wilkinson posted a picture of the young woman to Instagram with a heartfelt plea for change to a system that turns away women like Tara Brown when they most need help. Lisa Wilkinson’s lengthy Instagram post. 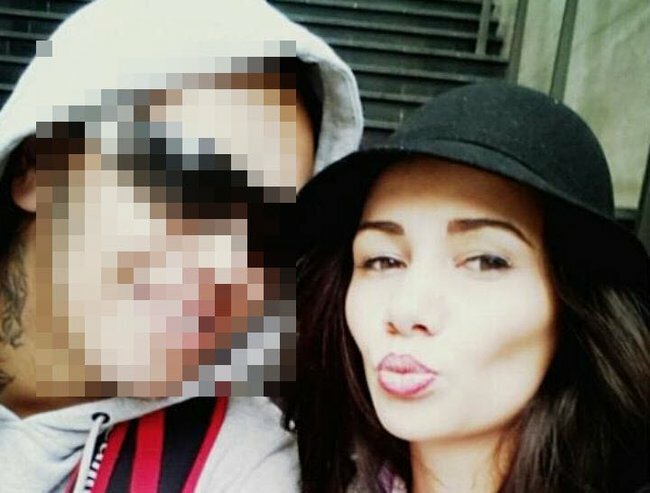 This is the face of 24yo “smart, intelligent, beautiful” Gold Coast mum #TaraBrown. Tara died this morning after allegedly being viciously bashed to within an inch of her life while trapped in the car she had just crashed after her ex forced her off the road. Last Thursday in fear of her life, Tara had gone to police for help to leave her partner but was turned away and told to seek help elsewhere. Tara leaves behind her young daughter who she had just dropped off at childcare. Tara’s tragic death comes on a day when another thug in Queensland who bashed his girlfriend until she passed out walked free from court, while yet another man with a criminal history was allowed out on bail to kill mother-of-two Jodi Eaton, a woman has been shot dead at a McDonalds on the Gold Coast, and as we mourn the death of a NSW grandmother and her 7 year old grandson allegedly at the hands of her own son. Please, don’t let Tara’s death – or all the hundreds of others we are losing in ever-greater numbers each and every year to domestic violence – just pass by unnoticed. Let’s get #TaraBrown and #StopViolenceAgainstWomen trending. Let’s put REAL pressure on our politicians, our beaurocrats [sic] and a “system” that turns women like Tara – and her young daughter – away in their moment of greatest need. And please, please spread the word with a double tap. Thank you. Tara Brown with her ex-partner.